A&R executives rely mostly on the word of mouth of trusted associates, critics and business contacts, rather than on unsolicited demo tapes. They also tend to favor the bands that play in the same city as the record label's offices. The A&R division of a record label oversees the recording process. This includes helping the artist to find the right record producer, scheduling time in a recording studio and advising the artist on all aspects of making a high-quality recording. They work with the artist to choose the best songs (i.e.repertoire) to record. For artists who do not write their own music, the A&R person will assist in finding songs and songwriters. A&R executives maintain contact with their counterparts at music publishing companies to get new songs and material from songwriters and producers. 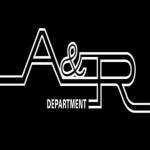 As the record nears completion, the A&R department works closely with the artist to determine whether the record is acceptable to the record company. This process may include suggesting that new songs need to be written or that some album tracks need to be re-recorded. A key issue is whether the album has a single: a particular track which can be used to market the record on radio. 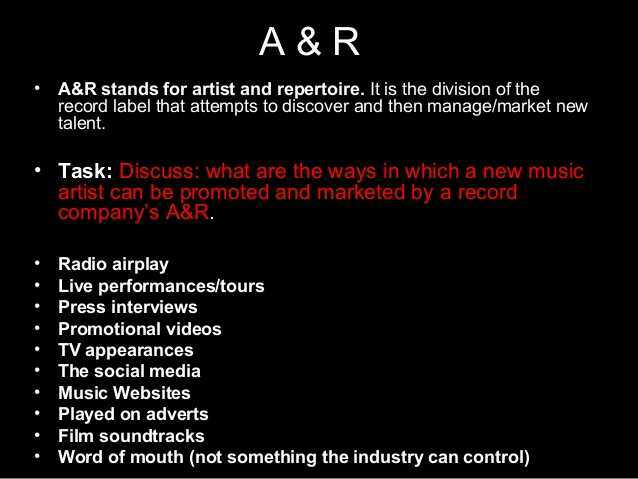 Once the record is completed, the A&R department consults with marketing, promotion, the artist and their management to choose one or more singles to help promote the record. The tastes of particular A&R executives have influenced the course of music history. A&R man John H. Hammond discovered Billie Holiday, Bob Dylan, Aretha Franklin and Bruce Springsteen. Hammond's colleagues were initially skeptical of these artists because none of them appeared to be creating "commercial" music. Hammond's instincts proved to be correct, and these artists went on to sell hundreds of millions of records. George Daly, Hammond's colleague at Columbia Records, proved the same instinct with bands as varied as outliers as the Tubes and Tool during his career. Geffen Records' Gary Gersh signed the band Nirvana at a time when alternative rock music was not considered commercial. Gersh was able to convince his co-workers to push the record in spite of their misgivings. In cases like these, A&R people have radically changed the direction of popular musical tastes and introduced large numbers of people to new sounds. This kind of prescience is, however, the exception rather than the rule. Historically, A&R executives have tended to sign new artists that fit into recent trends and who resemble acts that are currently successful. For example, Columbia Records' A&R man in the 1950s, Mitch Miller, favored traditional pop singers like Guy Mitchell and Patti Page, and rejected early rock-'n'-rollers Elvis Presley and Buddy Holly. This "trend following" mindset has generated several waves of narrowly defined genres, leading to a perception of triteness, including teen pop (1998–2001), alternative rock (1993–1996), glam metal (1986–1991) and disco (1976–1978). Trend following can be counter-productive, since it has often led to a backlash. Towards the end of the life of each wave, record companies have found themselves faced with enormous losses, as consumers' tastes changed. For example, at the end of the disco boom in 1978, millions of records were returned by record retailers, causing a deep recession in the music business that lasted until 1982, when Michael Jackson's Thriller finally brought the public back into record stores in large numbers. What you've got now is huge multinational companies where most of their A&R staff are businessmen. They’re people who look at music from the standpoint of marketing, not from the standpoint of music and talent. They will say, "Go out and get me anything that's popular now." According to Rhythm King Records and Lizard King Records founder Martin Heath, the A&R community in the UK is more integrated than it is in the US, being very London-centric and encompassing a relatively small number of people. "If scouts are chasing a band, you’ll see the same thirty people in one room. You get a herd mentality in the UK, but also some very diverse signings as well," he said in an interview with HitQuarters. Heath believes that in the USA it is more typical for A&R to wait until a band is established – having attracted other offers or achieved a level of sales – before taking action, a technique which often works out as being more expensive. New forms of digital distribution have changed the relationship between consumers and the music they choose. Gerd Leonhard and others argue that the wide selection of music on digital services has allowed music consumers to bypass the traditional role of A&R. In the wake of declining record sales, a large number of A&R staffers have been terminated. It is unclear whether A&R executives will shape the future of musical tastes as they have in the past.